Tied going to 18, holy cow! Oh my goodness what a round. These guys are playing incredibly right now. Wow! Cmon Sergio, the putt of your life! Wow, you've got to make that.. Woo! About time. Finally put it all together. He finally did it, what a moment! When Sergio went 2 down then had to take a drop on the next hole, I thought it was over. The old Sergio would have been done. Very happy to see Sergio get it done. Seve would be proud. Congrats to Sergio,but Matt Kuchar hitting the hole in one and giving the kid the ball was incredible. at the hole in disgust. Duffner definitely blew up and his round fell apart. poor advice he was giving? I am glad Spieth got off to a good start at the Memorial. He has been playing a lot of catch up lately. story than all his wins. I think he can write that chapter. can win this sudden death . Wow Lexi lost. 4 bogies on the back 9. Jutarnagaun wins. U.S. Open starts on Thursday. Course looks great. The stupid long fescue will make things interesting. 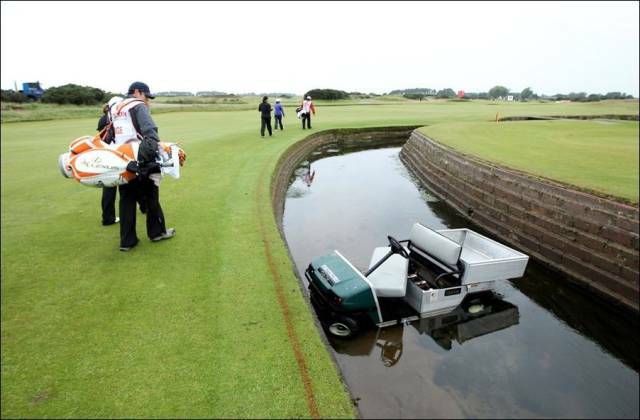 Hopefully the USGA doesn't try to screw anything up this year. Go Rory !! in the 2's. That's some serious cash. Quote of the day - " The course is using the golfers as a food source today". I correct my earlier post. That's a lot of tall grass! Will be interesting to see how the course plays today after playing easy yesterday. Very disappointed in how Rory played yesterday, what he said on Wednesday seems to have come back and bite him. top of it is yielding a possible new major winner. Should be fun. I am for Fowler or Harman. Saw them play back in their college days. a couple years ago. Maybe he can do something at his home major. Spieth is something else. Legend in the making. darlingtonfan and FLRacingFan like this. I love this ....can Tiger be in contention? dpkimmel2001 and darlingtonfan like this. Looking forward to the next 4 days. The Masters has that allure, such a great tournament, if Tiger is in the running, which I think he will be, it will be awesome. darlingtonfan, FLRacingFan and dpkimmel2001 like this. +1 with a couple of late birdies. Jordan closed really strongly today. Oh cool, thought he was worse off, come on Tiger.